Architect Frank Lloyd Wright was born in Wisconsin, and designed many houses in the Upper Midwest. There are several notable houses and buildings designed by Frank Lloyd Wright in Minnesota. 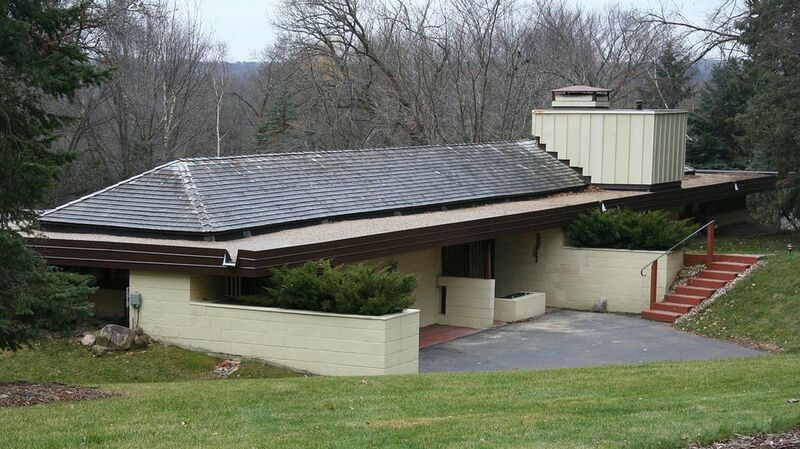 Looking for Frank Lloyd Wright houses in Minneapolis and the Twin Cities? There are four Frank Lloyd Wright houses in Minneapolis and the Twin Cities area. Here are the other Frank Lloyd Wright Houses in Minnesota. Unless otherwise specified, all of these homes are privately owned and are not open for tours. Austin: The S.P. Elam Residence, 309 21st Street SW, Austin: The S.P. Elam Residence was finished in 1951. The Elam House is one of the largest Usonian style homes designed by Wright, and the exterior features an upswept roof, one of Frank Lloyd Wright's most iconic designs. Unfortunately, the Elams had a falling-out with Wright during the construction, and while Wright had already designed the majority of the house, the Elams had to finish the kitchen without Wright. Photographs, floor plan and historical information on the Elam house is available from The Steiner Agency. Cloquet: The R. W. Lindholm House, Highway 33, Cloquet: The R. W. Lindholm House is a small home on several acres of land, in Cloquet, near Duluth. The residence is known as Mantyla to its owners. It is on Route 33 in Cloquet. The house, plus most of its original furnishings, was put on the market in 2009 with an asking price of $975,000. Cloquet: Lindholm Service Station, Highway 33 & 45, Cloquet: (1957) Located at the intersection of State Highway 33 and State Highway 45 in downtown Cloquet, this is the only gas station designed by Frank Lloyd Wright, as part of Wright's vision of a new urban landscape. The gas station is open and operating as a gas station, and also has a second floor observation room that overlooks the St. Louis River, open to visitors. Article and photographs of the Lindholm Service Station are available from Roadside America. Rochester: The Bulbulian House, 1229 Skyline Drive, Rochester: Rochester has three Frank Lloyd Wright houses. The Bulbulian House was built for a facial reconstruction specialist, Dr. Arthur Bulbulian, who worked at the Mayo Clinic. The house was completed in 1947. The house has an angular, Usonian design, and is orientated to catch the sun throughout the day. It has recently been restored. The Bulbulian House is still owned by members of the Bulbulian Family. It is a private home and not open for tours. Rochester: The Thomas E. Keys House, 1217 Skyline Drive, Rochester: This 1950 house was built a stone's throw from the Bulbulian House in Rochester. The Thomas Keys Residence is built with earth berms against some of the walls, and is another example of Wright's Usonian design. Check out the Thomas Keys Residence entry and photographs at Wikipedia. Rochester: The James MacBean House, 1532 Woodland Drive, Rochester: Frank Lloyd Wright designed three different models of prefabricated. Prefab #2 was a square, three bedroom house, designed to be constructed from concrete blocks and siding. ultimately, one two such houses were constructed from the Prefab #2 design, the James MacBean House in Rochester, in 1957, and the Walter Rudin House, in Madison, WI, also in 1957.Read more at the James McBean Residence entry and photographs at Wikipedia. Saint Joseph: Dr. Edward and Laura Jane LaFond House, 29710 Kipper Road, St. Joseph: The Edward and Laura Jane LaFond House in St. Joseph, near St. Cloud, was commissioned in 1956, but not completed until 1960, after Wright's death. Roller Coasters Inside a Mall? Yup.